Just a Guy’s monthly music article includes the top songs of October 2014. The restrictions are simple, the album or the song must have been released during the month in review. So as to encourage musical diversification, we only select one song per album per artist. With all the stipulations out of the way, let’s take a look at the best songs from October. We’ve already covered Hozier earlier, but the fact remains that he’s poised for a huge break. “Take Me to Church” is a soulful song, one that’s clearly established Hozier as an artist to keep an eye on. 2014 served as an introduction to the young singer, but 2015 is going to prove to be the year that he truly takes makes a name for himself. Like, Hozier, we’ve already covered Yellowcard’s new album, but “Transmission Home” truly is one of the standout tracks from Lift a Sail. As mentioned, the song is a slight departure from the band’s pop-punk trademark. It could easily be A Day To Remember track, if not for Ryan Key’s stellar vocals. The rest of the album deserves a listen, but “Transmission Home” is a great introduction. Weezer semi-returns to form with “Back to the Shack.” The group made a conscious effort to emulate the sounds of their earlier hits, and while the song doesn’t quite reach those heights, it is a nice enough track for fans of the band. 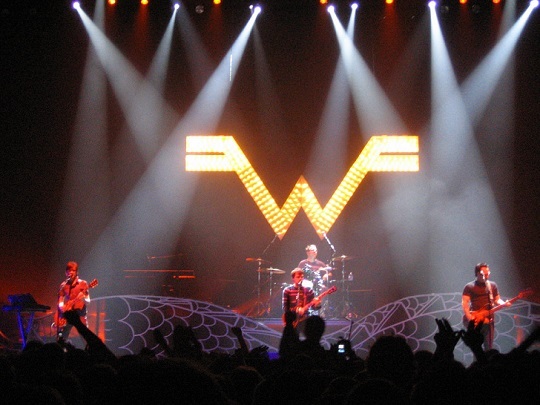 Weezer in 2014 isn’t going to be as great as they once were, but it’s hard to catch lightening in a bottle twice. The band has made a solid album that casual and diehard fans can appreciate. If this song hasn’t been stuck in your head then you’re not watching ESPN enough (or your roommate hasn’t sung it to you everyday). “Centuries” is yet another pop radio oriented song and is quite catchy. Chances are you’ve heard this song and if not you must live under a rock and should give it a listen. While tracks like “Believe Me” might get more publicity because of Drake’s feature or “Grindin'” is more radio friendly because of the simple repeated chorus, “Krazy” is easily a better performance. Lil’ Wayne’s talent shows through in this less than structured song and the video has enough going on to keep it interesting. This song is everything Slipknot is known for. It’s a thunderous track, but technical at the same time. The band went through a lot to make this new album. While they may not be as popular as they once were, Slipknot proves that they can continue to make great metal music, and there will always be a market for that. T.I.’s ninth studio album Paperwork is the final piece in his album trilogy, which also includes the good Paper Trail and the not so popular Troube Man: Heavy Is the Hand. The album includes a number of feature with Pharrell Williams as the executive producer. “About the Money” is the first single from the album and gives a good idea of what the album entails. Tom DeLonge’s other band, Angels and Airwaves, is readying for the release of a new album. New member Ilan Rubin is a game changer for this group. “Paralyzed” shows a band with new life breathed into it. Rubin has reeled in DeLonge’s expansive ideas and channeled them into a more concise sound. If the rest of the album sounds this good, it will be a must listen. Yet another hot dance track from the Scottish producer Calvin Harris. “Summer” encompasses the song title in regards to good feelings and potentially brief flings. A hard song not to sing a long to with minimal lyrics and a solid accompanying beat. After a 3 year hiatus the German band Tokio Hotel has made it’s return. “Run, Run, Run” was the first promotional song put out for their album Kings of Suburbia. The album sounds more adventurous than their “traditional” sound but still manages to sound familiar.